So, the rumor is that Verizon will be having an iPhone soon. The question for an almost out of contract account that has an upgrade available is — stay put or jump ship. So, is ATT perfect no. In fact problems in their network involve the length of time it takes us to get messages more than anything else. Often after checking the phone and not seeing any messages half an hour later there are half a dozen and they are all time stamped before my first check. That happens with or without a smartphone. What we want to know is can Verizon do better than that? Strangest thing on the ride home last night. We’re scanning the channels on the radio for something to listen to. Love the NY metropolitan area; the dial is full. You don’t have to wait a sec to get another station. We come upon some organ music, I’m talking big pipe-like organ. Craig gives it the thumbs up. We’re like – OK.
One tune is over and another starts. Organ again. This happened for about an hour with no voice interruption. We’re thinking this is pretty crazy; It’s the pipe organ station! We heard a voice come on and recap the composer and performer and then lost them as we were out of range. I do have to admit that I’ve been on a music thang lately. Has something to do with working so much. Listening to lots of tunes. Being in the soundtrack of your life. I’m not apologizing — I’m going with it. Who knows where it will lead. Hope you enjoy it with me. Homeward Bound, burned into my vocabulary. Just was playing a lyric game with my cousin. She’s had a ticket for her destination. She’s on the train now. Enjoy the journey. Love this video – classic. Spot On. John Stewart tells the Bruce Springsteen story. An American icon described. Nailed it. No video available for this one. I’m not so with Patti on this one. But it was worth another listen. Click on the title for a link to the recording. We were looking for something light and amusing to watch this afternoon and settled on this colorful comedy by one of our favorite directors, Pedro Almodovar. I you’ve never seen this film get some popcorn and rent it. Or buy it you can certainly watch it at least twice a year. Thinking of having a summer showing and Gazpacho night. Was reading RollingStone this morning and took a look at 50 artists choosing playlists. I’m always interested in listening to music that other musicians find essential or important. I’ve often found the selections that Patti Smith has made for her covers very interesting. So when she selected love songs by Bob Dylan I had to check them out and see if I feel the same way about her selections. Several topped my list at the start Boots of Spanish Leather, Sad-Eyed Lady of the Lowlands, and Visions of Johanna. So now I’m on my way to rediscover these other songs in her list and share them. I’m also looking for videos to share. Strangely almost all of the versions I could find of this song were in China. Piracy maybe? You can also listen at Dylans site. Just click on the song title below. Finally after many an effort the twins have been reunited. I looked for replacement glass for ages. No one seemed to carry the two cup carafe. Everytime I went on the Bodum website it was out of stock. Surprisingly, last Saturday I walked over to Old City Coffee to pick up my weekly 1/2 pound of Balzac beans. While the nice fellow in the red cap filled my reusable bag with beans; the replacement carafe stared at me from a nearby shelf. I picked out a box and added it to my purchase, put it in my pocket, and took it home. Joy! 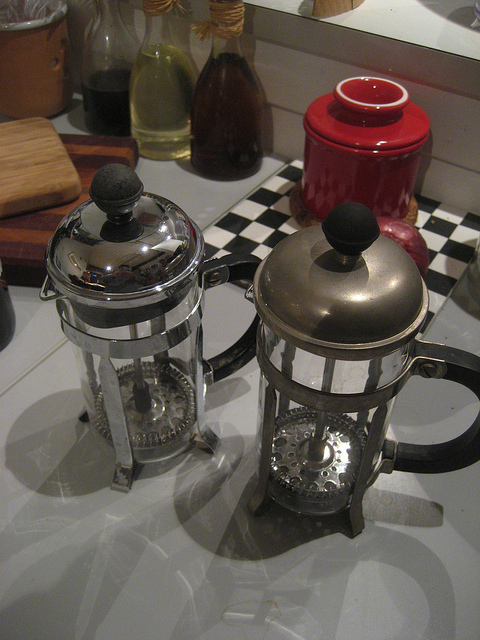 I washed it out and put it into my original Bodum French Press — one before plastic was added. Now the twins are reunited. But, a moment of indecision. Which one do I love best? Jean-Michel Basquiat was born today in 1960.